Garage doors generally use either an extension spring or a lift torsion spring to or counter balance the weight of your overhead door. 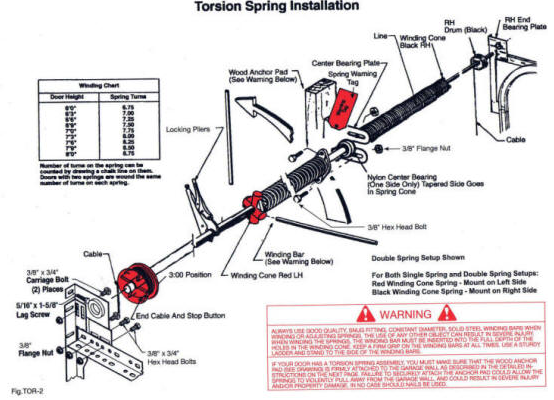 Torsion springs offer the best life expectancy. The life expectancy on most garage door springs is a calculated based on cycles. A cycle is one opening and closing of the garage door. Torsion spring life expectancy and the lift properties are determined by three things: the overall length of the spring, the wire Gage/thickness, and the diameter of the spring. The general life expectancy of a garage door spring is typically 5,000-10,000 cycles. Calculated at an average of 2 cycles per day, it works out to just over 13 years. While that is the average, we usually tell people to expect 8-10 years on any given garage door spring that are commercially available in the industry. Here at Gilbert garage door repair we love testimonials and success stories. Which is why we thrive to receive a 5 star review after every visit and become your go to garage door repair company for life. Damaged or broken springs can be caused by a large number of problems. Our tecnicians are equipped, trained, professionals, and well skilled, to handle these garage door springs. Even some of the lightest of garage doors can weigh over 100lbs, so torsion springs deal with a lot of force and abuse throughout their lifetime. The tension in garage door springs can incredible and very dangerous. This tension can be lost when they are damaged, or bent making them completely worthless. We recommend a service tune-up every 2-3 years. Let us come do an inexpensive maintenance tune up today. Springs are mounted above the garage door on a tube. On both ends of the tube are drums with lift cables that are attached to the bottom of the door. Smaller lighter garage doors only require one spring, but larger and heavier overhead doors will need two springs.